This video discusses the main features of the DPRO-L36 and also shows two surveillance video clips that were captured using the camera. The DPRO-L36 is an indoor dome CCTV Camera with 3-Axis Mount which enables ceiling or wall style mounting. This camera supports 700 TV Line of resolution and has a fixed 3.6mm Lens which gives you an 86 degree field of view. The 24 Built-in Infrared LEDs can effectively illuminate a distances up to 80 feet away. The DPRO L-36 is a available in a black or white colored base. Here we have two video clips captured by the DPRO L-36 one obviously with all the lights on in a room and then the one in the right is in complete darkness with all the lights turned off. You can see that the camera does a good job of effectively illuminating this room which is 13 feet wide by about 21 feet deep. The man starts out about 24 feet away and approaches the camera to about 8 feet away. The camera is mounted in the upper right hand corner of the room and you can see that the 3.6mm lens really can capture this entire room effectively. For more information and pricing on the DPRO L36, please visit www.cctvcamerapros.com/L36. Thank you for watching. 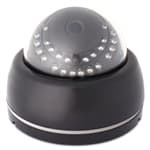 Click here to learn more about the DPRO-L36 Infrared Dome CCTV Camera used in this video.